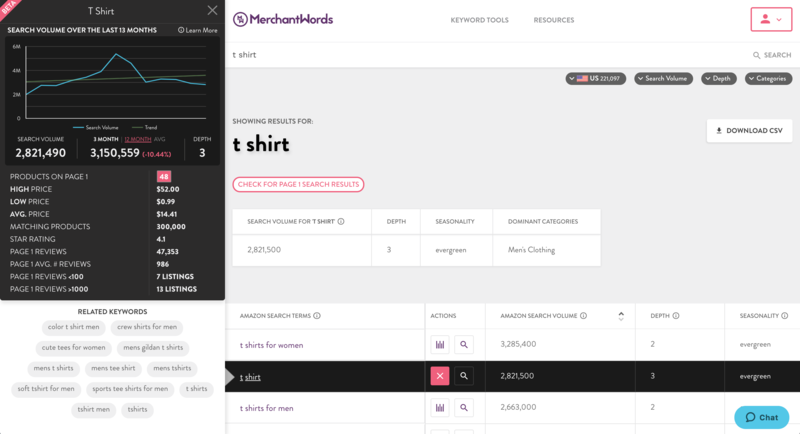 The MerchantWords Keyword History Analysis Panel is an easy-to-read and compelling snapshot of any Amazon keyword. 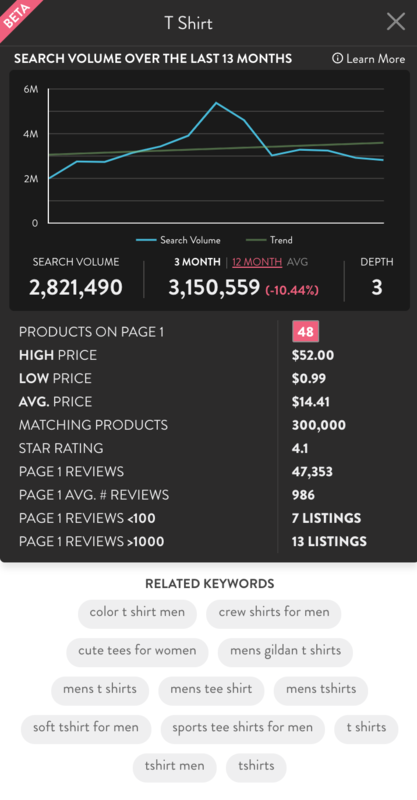 Our tool allows you to view one year of a keyword’s search history and trends, the average product price, number of reviews, related keywords, and more. To use the Keyword History Analysis Panel, simply click on the bar graph in the ACTIONS column. The blue line shows a keyword's search volume history over the past thirteen months. The green line represents the overall trend for the keyword. This number indicates the estimated monthly total of overall Amazon searches per keyword. The average searches for your chosen keyword over the past three months and the past twelve months, respectively. You can also see the percentage that the keyword or phrase has increased or decreased in the same time frame. This indicates how many letters one must type into the Amazon search bar before it is populated by a suggested keyword or phrase. Keywords with a depth of 1 are likely to be very competitive and commonly searched. Keyword depth can vary based on search trends, algorithm changes, seasonality, and new product releases. This metric indicates the current quantity of products available on page one of Amazon search results for this keyword. By clicking on this button you can view a list of these products by title, image, and key performance indicators. From there, you can perform a more detailed reverse ASIN search to reveal the top ranking keywords for each of your competitors. Pricing your product correctly is a crucial part of launching a product and remaining competitive. Here you can find the highest price, lowest price, and the average price for all product listings on page one of the search results. This number represents the total number of product results currently available on Amazon for the selected keyword. It’s can be a useful measure of the level of competition for a particular product when performing product research. The average star rating for all products on page one. This section compares the number of listings on the first page of Amazon search results with over 1000 reviews to the number of listings with under 100 reviews. These are synonyms, alternate names, and complimentary phrases associated with a keyword term. These keywords can be used for listing optimization and pay-per-click (PPC) ads. Clicking on one will start a new search for that phrase. Don’t limit yourself just to these terms! We recommend using them as a launch pad for your research. FINAL NOTE: We're currently only offering supply-side metrics for Amazon US, but will be rolling this data out to other countries soon. Which country is next? Email us at [email protected] with your vote!